Practice Computer Graphics questions and answers for interviews, campus placements, online tests, aptitude tests, quizzes and competitive exams. This section of our 1000+ Computer Graphics multiple choice questions focuses on Color and Grayscale Levels. 1. The color options are numerically coded with the following values. Explanation: Color options can have any value from 0 to any positive number. Explanation: The amount of storage provided per pixels in frame buffer provides verity range of colors. Explanation: All zero means it is black color (the mixture of red, green and blue). Explanation: The frame buffer is a space that is used to store the color information. 5. Whenever a particular color code is specified in an application program, the corresponding binary value is placed in? Explanation: With the direct storage scheme, the binary values of color are stored in frame buffer. Explanation: Any value ranging from 0 to 1 can specify grayscale levels. 7. With 3 bits per pixel, we can accommodate 8 gray levels. If we use 8 bits per pixel then what is the value of gray levels? Explanation: 8 bits per pixel means 2 power 8 i.e. 256. Explanation: By using setColourRepresentation (ws, ci, colorptr) we can set the color-table. Explanation: The intensity value 0.0 and 1 for black white respectively, and it is 0.33 for dark gray and 0.67 for light gray. 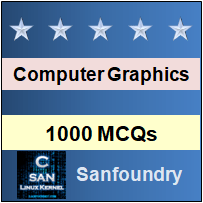 Sanfoundry Global Education & Learning Series – Computer Graphics. To practice all areas of Computer Graphics, here is complete set of 1000+ Multiple Choice Questions and Answers.